The Wild hope they’ll get a full season out of veterans Zach Parise and Ryan Suter, but the aging core doesn’t have the promise it once did. The Wild have six straight playoff berths, clearing 100 points three times in the past four seasons, so the fact they return with a similar roster to last year in theory gives them a high floor. They bring back their entire top-nine forward group and top four defensemen. They’re one of the NHL’s deeper teams up front, capable of icing at least two scoring lines, one centered by Eric Staal, who tied a team record with 42 goals last year, the other by captain Mikko Koivu, who usually plays with Jason Zucker and Mikael Granlund on a great two-way unit. Minnesota should see some progress from a few prospects, too. Beastly power forward Jordan Greenway looks ready to become a middle-six mainstay. Center Joel Eriksson Ek can’t possibly be as unlucky as he was in his bust of a rookie season (4.8 shooting percentage). Minnesota has mobility and offensive acumen in its top-four on ‘D,’ especially Mathew Dumba, who broke out for 50 points last season. Greg Pateryn was a cheap signing who profiles as a fancy-stats darling with his shutdown ability. The crease is in good shape with Devan Dubnyk, who ranks among the league leaders in wins and shutouts the past four seasons. It’s telling that a team so consistently competitive parted ways with its GM, replacing Chuck Fletcher with Paul Fenton. The Wild simply aren’t ascending. They’ve bowed out in the first round of the playoffs four times and the second round twice during this era of “success.” And they added almost nothing in free agency, hampered by hefty contracts such as Zach Parise’s, so there’s little reason to expect anything better than mediocrity. In fact, even mediocrity doesn’t seem assured. Workhorse defender Ryan Suter is coming off a broken ankle, for which he required a long recovery period. While he’ll be ready for the start of the season, he’s 33 and thus not a lock to come back as good as he was, which is scary news for a team that ranked 21st in goals against last year. Many of the Wild’s most important players are long in the tooth. Koivu is 35, Staal 33, Parise 34. The Wild’s average age is 28, making their roster the league’s eighth-oldest. If a team that hasn’t made any progress keeps getting older while its divisional neighbors, like St. Louis, make major off-season additions, it’s only a matter of time before the stagnant team starts to sink, especially in the deadly Central. Can Staal and Zucker repeat their offensive output? Last season, the Wild finished just outside the top 10 in goals for, potting 250 over the course of the 82-game slate. It was an impressive performance from an offense that was without arguably its biggest star, Parise, for nearly half the campaign. What drove the offense in Parise’s absence was the play of Staal and Zucker. The former, in his second season wth the Wild, had a mind-blowing season. Having not cleared the 30-goal hurdle, let alone the 40-goal plateau, since 2010-11, Staal went out and fired home 42 tallies for the second-best goal scoring campaign of his career. Zucker, meanwhile, had a career-best 33-goal output. That’s 11 better than his previous career high, and it came along with a 17-point improvement on his previous best point total. Together, Staal and Zucker’s 75 goals accounted for 30 percent of Minnesota’s total offense. But what if one or both regress? There’s reason to believe that could happen. Staal had the best shooting percentage of his career last season and shot a full 6.2 percent better than his career average. Zucker put up his best full-season shooting percentage, and he was two percent clear of his career average. If those shooting percentages dip down to career-average levels, both could see dips in their goal total and it will be on others, particularly the youngsters or a hopefully-healthy Parise, to pick up the slack. 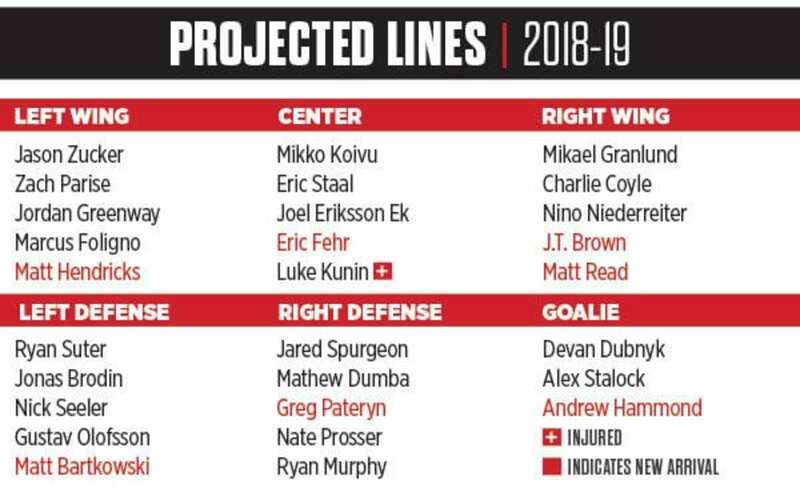 THE HOCKEY NEWS’ PREDICTION: 6th in the Central Division. The Wild have likely reached their ceiling with the current core and the next generation isn’t yet ready to take over and guide Minnesota forward. In a division as tough as the Central, the Wild have been passed by. Not irreversibly so, but they’re not the contender they once were and if the window is open at all, it’s only crack.